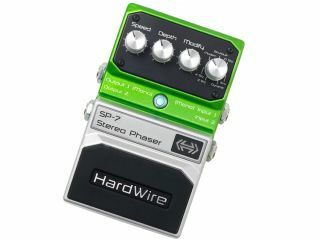 NAMM 2011 PRESS RELEASE: HardWire®, a leading manufacturer of guitar pedals, today introduced the SP-7 Stereo Phaser Effects Pedal. The SP-7 is an advanced Phaser effects pedal offering seven Phaser types based on popular new and vintage effects pedals including 2-stage, 4-stage, modern, boutique, 10-stage, envelope and dynamic. Leveraging DSP originally developed for the DigiTech RP Series of products, the new pedal also features controls for speed, depth, modify and phaser type, as well as an indicator LED and tap tempo switch for setting the phaser's effects modulation speed time during a live performance. The SP-7 also includes HardWire's trademark extreme performance features, such as true bypass and high-voltage rails. It also features true stereo I/O, allowing for complex connections and sounds with extreme flexibility.